Here at Mountain View Eye, we are excited to provide you with the perfect pair of glasses. We recognize that finding the right frame and style that best fits your face shape is important. That’s why our friendly optical staff is highly trained to assist you in picking out the frame that best fits your lifestyle and needs. We carry Kate Spade, Hugo Boss, Silhouette, Vera Wang, Ray Ban, and more! 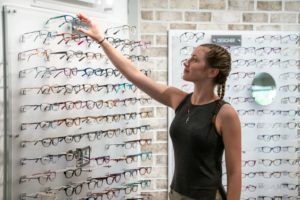 We are proud to offer state of the art lenses, digital single vision lenses, digital progressive lenses that use non-glare options with a blue filter used for macular degeneration prevention, and polarized lenses for optimal sun protection. No glare lenses give you the clearest vision possible with glare, scratch, and smudge protection. Single Vision Lenses help defend against digital eye strain so your eyes stay relaxed and comfortable. Adaptive Lenses adapt to changing light keeping you comfortable and protected in all conditions. Polarized Lenses provide maximum protection for the best vision under the sun. For the full list of lenses we offer and their benefits, please visit https://www.essilorusa.com/products. For more information on our glasses and brands, please don’t hesitate to call us today at (814) 946-3937! Protecting your eyes from the sun is crucial, that’s why Mountain View Eye carries a variety of fashionable and polarized sunglasses. We carry Costa, Ray Ban, Wiley X, and designer sunglasses including Michael Kors and Steve Madden. We recognize that finding the right pair of sunglasses that best fits your face shape is important. That’s why our friendly staff is highly trained to assist you in picking out the frame that best fits your lifestyle and needs. Although frame shape is important, it is essential to find the right pair of sunglasses that offer the best protection for your eyes. If you’re a fan of the outdoors and sunshine but hate the glare that comes with it, polarized lenses may be right for you. When light is reflected from flat surfaces, it tends to become polarized, meaning it travels in a more uniform direction (usually horizontally), creating a sometimes dangerous intensity of reflected light that causes glare and reduces visibility. Polarized lenses contain a special filter that blocks this kind of reflected light, enabling full visual enjoyment of the beautiful outdoors. Blue Mirror: Best for bright, full-sun situations on the open water and offshore. Green Mirror: Enhanced vision and contrast for fishing inshore and on flats. Gray Silver Mirror: A good everyday choice for activities on the water and land. Copper Silver Mirror: Well-suited for stream fishing and other environments with varying light. Gray: A good everyday choice for activities on water and land. Copper: Cuts glare for eye comfort in a variety of situations, from sight fishing to driving. Sunrise Silver Mirror: Extended wear lens. The perfect tool for dusk and dawn performance.